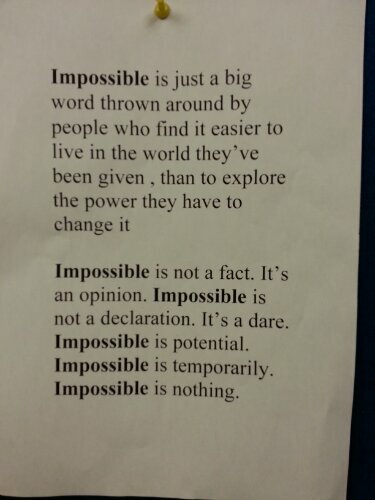 I was at one of our projects yesterday and saw this on the noticeboard. Posted on December 12, 2013 December 11, 2013 Categories ResilienceTags impossible, life, progress, resilienceLeave a comment on What is impossible? You were born as a matter of chance. Nothing more than genetics and luck. Your personality was largely hereditary. The school you went to, was chosen by your parents. The clothes you wear are determined by fashion and the media. If you went into further or higher education, it was the institution who picked you. You have never got a job, the employer always chose you. Your friends are selfish. They remain your friends because of what they want or need. Your family are selfish. They will always demand more from you. The things you buy are sold to you by clever advertising. Now we’ve got that out of the way, who are you? Posted on September 24, 2013 September 23, 2013 Categories UncategorizedTags destiny, fate, lifeLeave a comment on Who are you? Probably the toughest thing about helping others to be their best self is finding the right set of things that a person needs to do in order to build a range of activities which help them be their best self. It’s a tough world, with tough decisions to be made all the time. We have to balance family life, work life, our health – both physical and mental, financial health, and if it’s in our power – community and societal health. All of these and more add to such regular activity that it can be easy to lose sight of what you need to be your best self. Indeed some of the above may well be part of the mix which helps a person be their best. I’m in the throes of looking after the kids for a few days while the wife is on a break from the family. There’s a few things about this which highlight to me the importance of finding your third place. First, parenthood is hard. No, this is nothing new, but by God it’s tough. There’s not a moment – even when sleeping – that you switch off when you don’t have your partner as back up. I’m in a fortunate position in that we live with my parents, so there’s some support from my mother. Even with that support though, it’s still up to me to make sure my kids are ok and things are happening in a timely fashion, that I’m passing out attention across the three of them with some degree of fairness, and that I’m ignoring them in equal measure. Oh yes, with three of them doing things, at some point one or the other gets ignored. Tempers get frayed, and voices get raised; giggles happen and fits of laughter too – it’s all par for the course. I love having this time with the kids because it helps build my confidence in doing things with them, and gives me a big sense of achievement. My wife has proper deserved this time off she’s taking. The kids default to wanting to be around her and have her involved in their activities because when she’s not at work, she’s with them. For the past six years, she’s not had a chance to look at how and where she wants to move forward, so when this opportunity came up she grabbed it by the horns. More power to her. Both of those occurrences make me think about how hard it is to fit in finding your third place. What is this third place? It’s a place outside of your home/family life, and your work life (first and second lives) where you can be your best self free of judgement and pressure. This third place concept is important in positive psychology. It’s about recognising that as individuals we need to be mindful of taking care of ourselves. I think of this as nourishing the soul. We can get so caught up in the day to day and thinking that we’re being our best self, that we forget that a core part of your self, is your self. Life is increasingly complex and we have too much to tell us how to live a good life. Eat well, sleep deeply, have friends, laugh with people, take exercise, etc. I’m actually in accord with all of that. It’s good advice, and we should all be more mindful of how we’re taking care of ourselves. But what about doing things which actually allow us to just be? To just do something where you know you can be your best and it takes no effort? Am I talking about a hobby? No. Am I talking about going to the gym class? No. Am I talking about watching a film? No. Am I talking about reading? No. I’m talking about an activity you can do where you are actively engaged in it, it takes little effort to enjoy the activity, and you can lose yourself with ease. It’s hard isn’t it? Can you think of it? Maybe you’re already doing it. Maybe you’ve always been doing it. Maybe it’s never occurred to you. Maybe you need to give it some considered thought. Maybe you haven’t had the time or even got the time to make it happen. You have permission to do this. I’m not giving you that permission, it’s always been yours to exercise. It’s why my wife will benefit so much from this break, and I will benefit from being immersed with my kids. This third place will be unique to you, it will be something only you can know of yourself. Very few others can identify what this is for you – and at best it may only be those closest to you who may have an inkling of this. What is my third place? These days I’m not so sure to be honest. At one point it was skiing. Later it was technology and social media. These days though, I’m not so sure. I’m lucky in that I’ve always enjoyed the work I do, and that my family are well and healthy. Finding my third place could be seen as indulgent, and to some extent it probably is. But don’t forget we’re talking about moving from a position of ‘0’ (normal) to ‘+5’ (vibrancy) for everyday people. And I guess that’s something which we probably don’t realise we’re allowed to have in our lives. Why should things have to be a slog? Why can’t things be vibrant? Life is tough, and at the same time beautiful. I hope by now that you know me enough to recognise I don’t promote half arsed activities based on an intuition. I base what I write about on research and evidence, and this is part of the mix of things which can help someone live a good life – and that’s what we’re all trying to achieve.